410 pages | 150 Color Illus. | 250 B/W Illus. [This book] is attractively presented with clear images. Most sections include a discussion of the indications for and planning of each procedure. An interesting aspect of the book is the case vignettes that accompany each procedure, which truly simplify the clinical scenario and treatment strategy.This effort truly represents a practical approach to performing the open and endovascular procedures presented in the book. 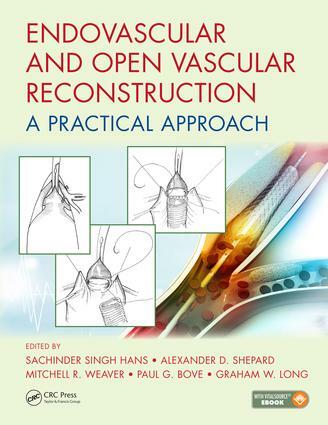 Trainees who are not experienced in performing a procedure, and even experienced vascular surgeons who have not performed a particular operation or endovascular intervention in a while, can refer to this book for a quick review. This is the rare textbook that provides insight and advice for all levels; from the medical student interested in vascular surgery to the experienced surgeon. The editors have managed to distill a contemporary vascular surgery practice into a manageable sized text, while still respecting the underlying pathology, natural history, and epidemiology of the entire breath of vascular disease processes. This is an excellent reference book for surgeons of all levels, and I would recomend it for anyone who takes care of the vascular surgery patient. The benefit of this book is that the authors describe the optimal technique based on their own experience. I thoroughly recommend this book and found it worthwhile during my training to become a vascular surgeon. ENDOVASCULAR PROCEDURES. Carotid angioplasty and stenting. Stenting for Occlusive Disease of Aortic Arch Branches. Visceral Artery Stenting for Occlusive Disease. Endovascular Intervention for Occlusive Disease of the Renal Arteries. Endovascular Management of Aortoiliac Occlusive Disease. Percutaneous Intervention for Femoral-Popliteal Artery Occlusive Disease. Percutaneous Intervention for Infrapopliteal Occlusive Disease. Endovascular repair of infra renal abdominal aortic aneurysm. Endovascular Repair of Iliac Artery Aneurysms. Endovascular Repair of Ruptured Abdominal Aortic Aneurysm. Endovascular Repair of Popliteal Aneurysms. Endovascular Repair of Pararenal and Thoracoabdominal Aneurysms. Endovascular Repair of Thoracic Aortic Aneurysms. Endovascular Repair of Aortic Dissection. Endovascular Management of Splanchnic Artery Aneurysms. Iliac Vein Stenting. Pharmacologic and Pharmacomechanical Thrombolysis for Acute Deep Vein Thrombosis. Endovenous Catheter Ablation of the Saphenous Vein. Explantation of Aortic Endograft. Inferior Vena Caval Filter Placement and Retrieval. OPEN VASCULAR RECONSTRUCTIONS. Carotid Endarterectomy. Standard Approach. Eversion Carotid Endarterectomy. Re-do Carotid Endarterectomy. Carotid Interposition Graft for failed carotid stenting. Carotid Endarterectomy for High Plaque. Extracranial Carotid Aneurysm Resection. Resection of Carotid Body Tumors. Carotid Subclavian Bypass and Transposition. Vertebral Artery Reconstruction. Upper Extremity Arterial Occlusive Disease. Brachiocephalic Reconstruction. Upper Extremity Arterial Occlusive Disease – Distal Revascularization. Aortic Aneurysms. Nonruptured Infrarenal and Juxtarenal Aortic Aneurysms. Nonruptured Infrarenal Abdominal Aortic Aneurysm. Suprarenal Abdominal Aortic Aneurysm. Open Repair Thoracoabdominal Aortic Aneurysms. Inflammatory Abdominal Aortic Aneurysms. Splanchnic Artery Aneurysms. Renal Artery Aneurysm. Primary and Secondary Aortoenteric Fistula. Open Repair Femoral and Femoral Anastomotic Aneurysm. Open Reconstruction for Popliteal Aneurysm. Open Repair Thoracic Aortic Aneurysm. Iliac/Femoral Endarterectomy and Iliofemoral Graft. Aortofemoral Bypass Graft. Surgical Management of Adult and Pediatric Renovascular Hypertension. Crossover Femoral - Femoral Graft and Axillofemoral Graft for Occlusive Disease. Thoracofemoral Bypass for Aortoiliac Occlusive Disease. Aortic Graft Infection. Infrainguinal Bypass Graft for Occlusive Disease. Surgical Management of Chronic Mesenteric Occlusive Disease. Vascular Trauma. Truncal Vascular Trauma. Extremity Vascular Injuries. Extracranial Carotid and Vertebral Artery Penetrating Trauma. Blunt Thoracic Aortic Trauma. Dialysis Access. Thoracic Outlet Syndrome. Vascular. Neurogenic. Open Venous Thrombectomy. ENDOVASCULAR & OPEN VENOUS RECONSTRUCTIONS. Endovascular/Open Central and Peripheral Venous Reconstruction. Sachinder S. Hans, MD, FRCS(C), FACS, is the Medical Director of Vascular and Endovascular Services at Henry Ford Macomb Hospital and Chief of Vascular Surgery, St. John Macomb Hospital, Warren, MI, USA. Since 1980 his practice has focused on Vascular Surgery and he has built up a registry of 6000 vascular reconstructions. He holds current board certifications in vascular surgery, Surgical Critical Care And General Surgery. Dr Hans has presented at the annual meetings of the American College of Surgeons and the Society for Vascular Surgery and has published over 60 papers in peer-reviewed journals with 15 video presentations.